Stretch marks are due to the skin irritation, inflammation, itching and pregnancy. 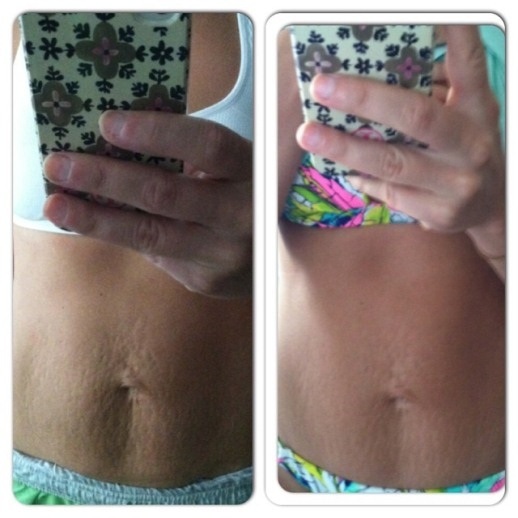 Most affected areas for stretch marks are abdomen, thighs, arms, legs, buttocks and breasts. There are many aspects belong to the stretch marks that cover the larger surface of the skin such as gaining weight and loss in weight, growth of muscles, inheritance, stress and changes in physical body structure and conditions. Stretch marks can easily visible on the skin layer. While skin contains three main layers. Middle layer is the specific layer where the stretch marks are formed as the connective tissue is present in between the layers so that it gets stretched due to the muscle contraction and expansion of the skin. A compound called collagen is present in the skin which works in the prevention of the layers of the skin. The cycle and normal production of the skin gets damaged if once it is attacked by the stretch marks, at last it leaves the fine scars on the topmost layer of the skin. Marks are appeared in the form of pink or red spots but the continues stretching of the skin, the stretch marks are formed. Stretch marks sometimes are unbearable and uncomfortable so it needs a proper and immediate treatment. Castor oil is used for reducing the stretch marks as it is reliable to treat other skin problems such as age spots, wrinkles, moles, dark spots, fine lines and pimples. Apply a little quantity of castor oil directly on the stretch marks and massage the area with the gentle motion of your hands for 10 minutes. Now take a piece of thin cotton cloth and wrap the area with it. Now place a heating pad on that area for half an hour. Follow the procedure on the daily basis for about a month and notice the results. Aloe vera is famous for its properties as it deals with thousands of problems related to the skin. It contains healing and soothing qualities and thus works great for getting rid from stretch marks. There are two simple ways to apply the aloe vera. Take an aloe vera leaf and squeeze out its gel then rub this gel on the affected parts. Now leave it for approximately 15 minutes then rinse it off with lukewarm water. Another option you can do is take one-fourth cup of aloe vera gel, vitamin E oil and vitamin A oil. Now mix these three ingredients together and rub this mixture on the stretch marks. Leave the mixture until it gets absorbed by the skin. Repeat the procedure regularly until you see some improvement. Egg white contains amino acids and proteins so you would have to separate the egg white and egg yolk. Take two eggs and separate the egg whites then beat it properly with the help of fork. Clean the area of stretch marks with water then apply a thick layer of the egg white using a makeup brush. Sit on the aired place so as to dry the egg white completely. Apply a little bit of olive oil to keep your skin moisturized. Repeat the mixture regularly for at least two weeks. Lemon contains natural acidic properties due to which it helps in the reduction of inflammation caused by the stretch marks, acne, and scars. Lemon has freshening properties which soothes the skin and make it feel refreshing. Take a lemon and cut it into half. Take a half part of lemon and rub it gently on the stretch marks with the circular manner. Lemon juice will be absorbed into your skin so leave it on the skin for about 10 minutes then rinse with water. Other process may be applied that mix equal amounts of cucumber juice and lemon juice. Apply this mixture directly on the stretch marks. Sugar helps in the exfoliation of the skin so it also proves to be good to get rid of the stretch marks. Take one tbsp of raw sugar and mix it with some quantity of almond oil and few drops of lemon juice. Apply this mixture on the stretch marks. Rub slowly for few minutes before taking a shower. Do the remedy for at least one month and watch the results. Potato is enriched with vitamins and minerals due to which it is helpful for restoration of the dead skin cells. Take a medium-sized potato and cut it into thick slices. Take one of the piece and start rubbing it on the stretch marks slowly for few minutes. Let it dry for a while then wash it off with lukewarm water. Alfalfa is also a great herb which contains amino acids that tends to be essential for the healthy skin. Not only that, it is also rich in vitamins E and K that help in nourishing the skin. Take some alfalfa powder and mix it with few drops of chamomile oil to make a smooth paste. Massage the affected area with the help of this paste about two to three times a day. Cocoa is found to be essential to protect the skin. Cocoa butter is therefore recommended to reduce the stretch marks completely as cocoa is said to be a natural moisturizer for the skin because it helps in nourishing the skin. Directly apply some quantity of cocoa butter on the stretch marks two times a day for few months. Another thing you can do is take a half cup of cocoa butter, one tbsp of wheat germ oil, two tsp of grated beeswax and one tsp of apricot kernel oil and vitamin E oil. Mix all the ingredients well together then place it in an oven to heat it slightly until the beeswax melts perfectly. After that, store the mixture in an airtight container and place it in the refrigerator. Now apply this mixture on the stretch marks three times a day. Your skin will remain smooth and hydrated all the time. Olive oil is also very reliable for various purposes of the skin as it has natural antioxidant properties and different nutritional properties due to which it is useful for healing various skin problems including stretch marks. Slightly warm the extra-virgin olive oil and apply it directly on the affected area. In this way the massage helps in the improvement of blood circulation and reduces the stretch marks. Leave the oil for half an hour so it gets completely absorbed in the skin. At last rinse it off with warm water. Water is the first and necessary requirement to keep your skin always hydrated. Drink at least 8 glasses of water everyday to avoid many kinds of problems. Water helps in detoxification of your body and protects it from many germs and diseases. Water also keeps your skin supple and smooth. Water also helps in maintaining the elasticity of your skin. You are suggested to avoid coffee, tea or soda and make yourself habitual of drinking more and more water per day.